Let’s back up for a moment. In my last post, I skipped over something that happened the night before Brynn’s birth. When we learned Brynn had changed positions, our OB had several questions. Specifically, when my last Lovenox injection was administered and whether or not I could have the C-section under local anesthesia. I would not be allowed to get a spinal block within 24 hours of my last injection due to the risk for spinal column bleeding and subsequent paralysis. The original plan was to do my last injection on Monday. The half-life for Lovenox is 24 hours, so we would’ve had an additional 24 hours to be sure the medication was completely eliminated from my body. As we know, things don’t always go as planned. If I couldn’t have the spinal block, the only other options was general anesthesia. I was already nervous about having the surgery to begin with. The thought of going under general anesthesia was downright frightening. What if something went wrong during delivery and I woke up to the worst possible outcome? I wanted to see and hear Brynn as soon as she was born. I just couldn’t wrap my head around not being awake the entire time. Luckily, my C-section was scheduled right at the 24-hour half-life mark. The OB and her team felt confident that we weren’t taking any unnecessary risks. I was so relieved. Fast forward to the next morning. 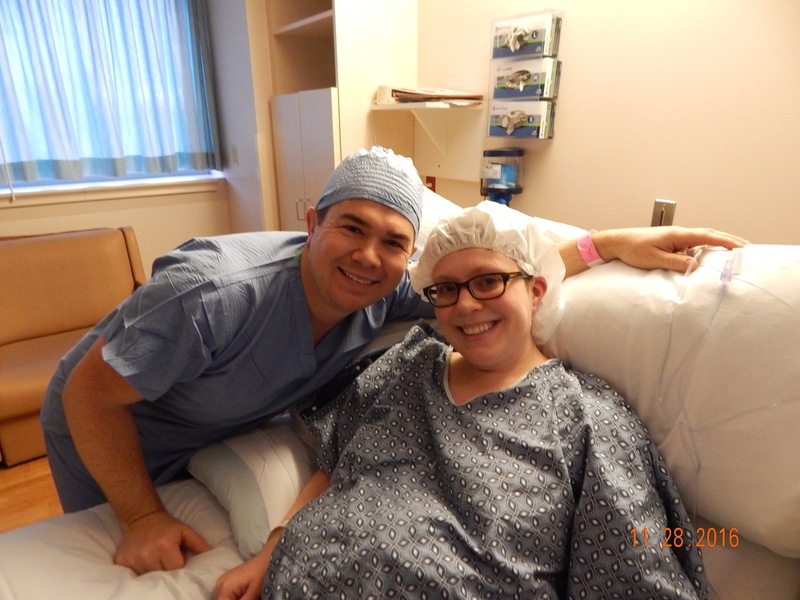 Once I was prepped for surgery, P explained what to expect from start to finish. She took a few photos of us and then off we went to the operating room. Time seemed to pass by so fast that morning. I remember my heart feeling like it was going to beat right out of my chest. I was so nervous. The OR was bright, cold, and sterile (the exact opposite of how I imagined the atmosphere for a vaginal delivery), just as P described it to me. Ben had to wait outside while I got the spinal block, which was probably the scariest part of the procedure, medically speaking. After they hooked me up to the various monitors, I was instructed to sit completely still on the table, hunched over a pillow. That was a little challenging considering I was shivering from the cold room temperature. P let me lean on her to steady myself. She wrapped her arms around me and spoke words of encouragement. It will go by so quickly. You will be holding Brynn soon. Once the spinal block was administered, I laid down and waited for the numbness to kick in. Inhale. Exhale. Focus. I could hear each and every breath. In and out. It felt heavier and heavier as the anesthesia started working. After a few minutes, I felt nauseous, which I was warned about. It made me nervous because, well, who likes feeling super nauseous? They gave me anti-nausea medication in my IV, and it went away just as quickly as it came on. At that point, Ben was still waiting to come in to the OR. While I waited for him, the head anesthesiologist sat with me and held my hand. She made some small talk and asked where Ben and I were from and how we met. We talked a little about Elliot and my tattoo and Brynn. Finally, Ben was allowed to join me in the OR. The OB used the fetal Doppler to check Brynn’s heart rate one last time before making the incision. Thinking about that moment brings back so many emotions. I remember praying so hard that there was a heartbeat to be heard. Please let her be okay. Please, God. Please. It always sounded so beautiful, but in that moment it was so much more. It felt like a true miracle. The OB confirmed that everything was okay. “There’s your baby’s heartbeat. It’s beautiful.” Before I knew it, the OB was making the incision, and my medical team was hard at work making sure Brynn and I were well cared for. I don’t really remember what my exact thoughts were as we waited for Brynn to be born. I recall staring up the ceiling just trying to breathe. Inhale. Exhale. Focus. I’m sure I prayed and begged for everything to be okay. Ben held my hand and kept telling me I was doing a great job. The surgery began at 8am and by 8:16, Brynn was born. The surgery itself wasn’t bad at all. I felt some pulling and tugging, but that was it. Once the OB announced Brynn’s time of birth, and that she was perfect, Ben was invited to peak over the surgical drape. And there she was. I couldn’t see the expression on Ben’s face because he was wearing a blue mask, but when he looked back at me, I could see it in his eyes – relief, elation, excitement, love. So much love. Even though everyone said she was doing great, I still asked a bunch of times if Brynn was okay. My heart has never pounded as hard as it did while I waited to see Brynn with my own eyes. To hold her. Even though I heard her cry, I needed to see her to truly believe it. While I was stitched up and glued back together, Brynn was cleaned, weighed, and measured. I remember P laughing and telling me that Brynn was a fighter. I think she was trying to bat P’s hands away from her or something. Finally, it was time. Ben brought her over to me. More tears. I couldn’t believe it. She was really here. And she was alive. My baby was alive. It was so surreal. I had hoped and prayed, and hoped and prayed some more, this day would come. I felt like I could breathe again. More love. More tears. More appreciation. More pride. We did it. We made it this time. SHE made it. When the surgery was finished, we were moved to recovery. We did skin-to-skin, and Brynn was a champ with breastfeeding. Ben and I couldn’t stop staring at her. I think we were both still in disbelief that she was really ours and in our arms. Everything seemed to move quickly that morning. I was pleased with how well pre-op, the surgery, and post-op went. Every person in the operating room was kind and supportive. I could not have asked for a better medical team that day. I will always be grateful for the care we received at South Shore Hospital. If I could go back and do it again, I wouldn’t change a single thing about Brynn’s birth. It was unpredictable and scary, but it happened in the most beautiful and perfect way. A special thank you to Ben and Elliot for being there with Brynn and me every step of the way.